Simply opt in our out at any time by purchasing weekly as you go. OR you can sign up for a weekly subscription. Get a new plan sent directly to your inbox every Friday for $4.99 per week. Cancel at any time, for any reason. Get a new plan sent directly to your inbox every Friday by 12pm PST. Shop on Saturday, prep on Sunday and kick back and relax in the evenings throughout the week! These low carb and gluten free meal plans are designed to feed 2-4 people for 5 days and utilize leftovers to save you time and money. Spend that extra time with your loved ones, instead of in the kitchen. There are 3 breakfast recipes, 3 lunch recipes, 4 dinner recipes, 3 side dish recipes and an optional dessert recipe. Even though there are only 3 or 4 recipes per category, there are enough servings for 5 days worth of meals. Days are not assigned to the meals. That way, you can mix and match the recipes according to your own preferences and schedule. Need more food? Or maybe less? No problem! I provide tips for how to scale the recipes up or down to best suit your families needs. All recipes have a full color photo, nutritional analysis, ingredients and directions. They also include a link to view each recipe online. They are all low carb and gluten free and are less than 10 net carbs each. Most are much lower. They are comprised of easy to find, real, whole food ingredients. No funky, hard to find specialty ingredients. Each plan builds off the week prior to maximize ingredients and reduce your grocery bill. 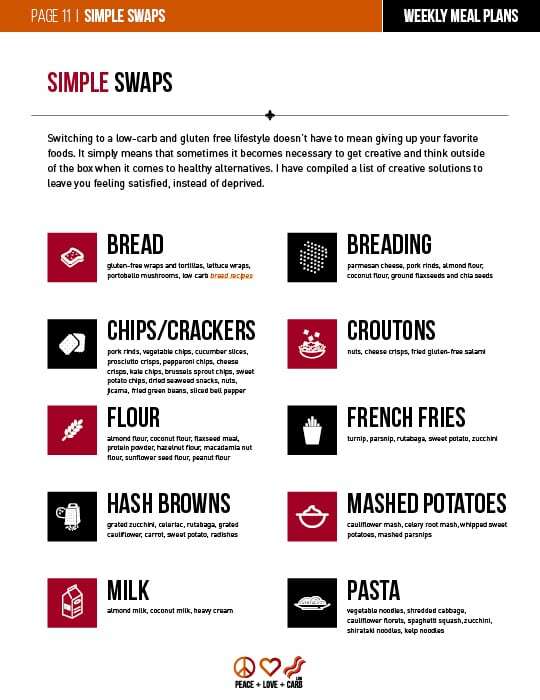 You can mix and match the recipes to stay in the carb range that best suits your current needs. 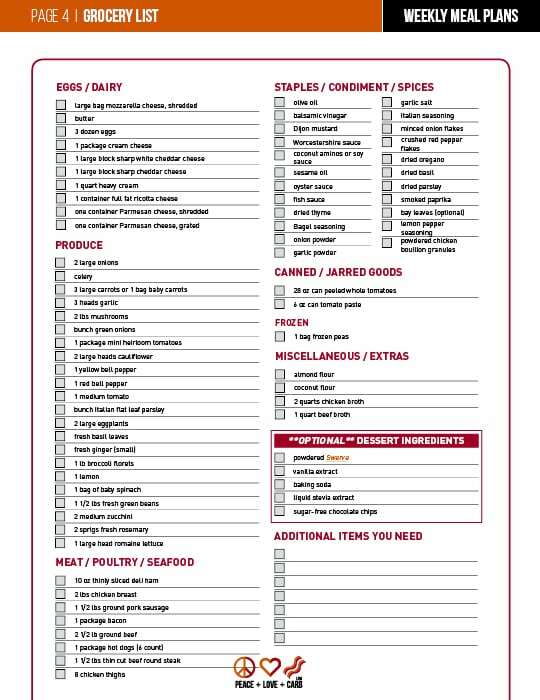 Each weekly meal plan comes with a printable grocery list. The days of getting home from the grocery store, only to realize that you forgot an ingredient for dinner are over! The grocery list is organized by department. No more running back and forth across the store as you cross things off your list. There is even a spot to write in any additional items you might need for the week. 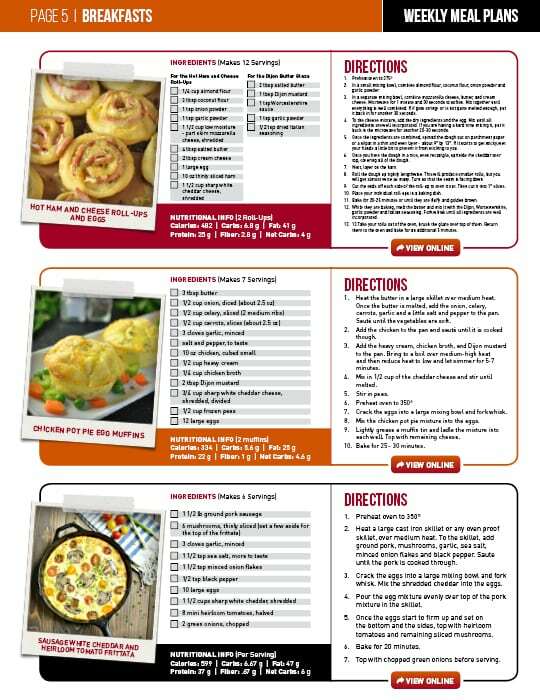 Each plan contains a list of suggestions for substitutions specifically for that weeks recipes, based on common food allergies, likes and dislikes. There is also a list of meal prep tips and tricks to help save you time and money each week. The goal is to minimize your grocery bill and maximize your free time. 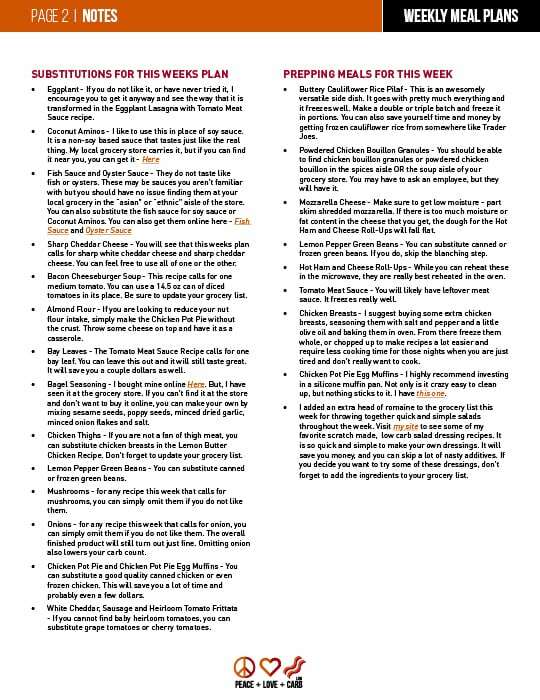 In addition to everything I have already listed, each new meal plan contains a new low carb and gluten free resource. 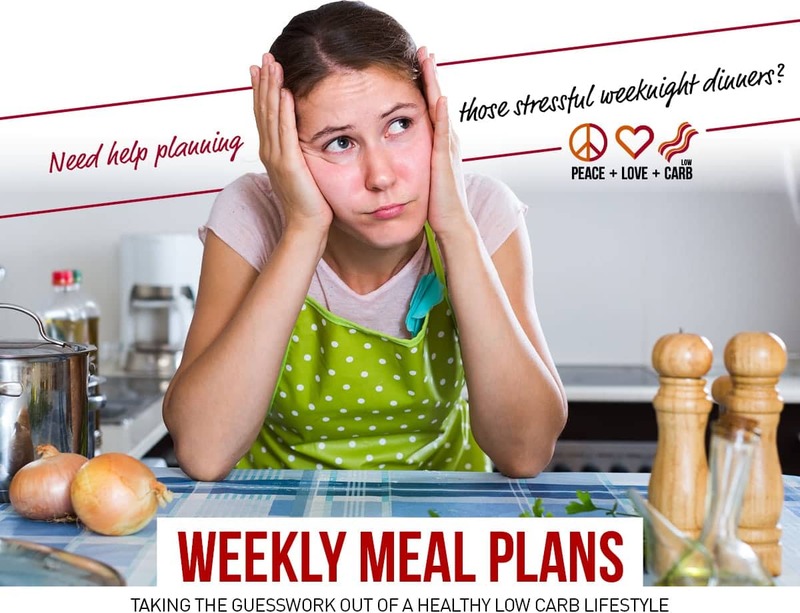 Not only will these meal plans help you take the guesswork out of your low carb and gluten free lifestyle, but they will arm you will all the tools you need to educate yourself on this way of eating and keep you on the road to success! Some of the resources you can expect to see through the weeks are: Ways to maximize Your Grocery Budget, Hidden Sources of Gluten, Convenient Conversions, Cooking Terms Defined, Simple Swaps, Recipe Round-Ups, 50 Low Carb and Gluten Free Snack Ideas and much, much more! Each week contains a 7 day journal where you can spend a little time each day writing about your food, your workouts, and how you are feeling overall. Each day provides a little food for thought, question, or quote to be thought provoking and help get those creative juices flowing. 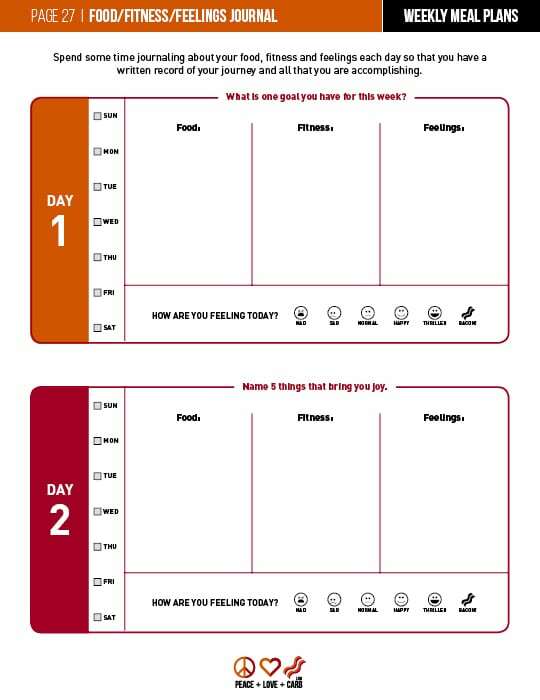 There is also a spot each day to rate how you are feeling and to set goals for the week. Low carb and gluten free recipes with full color photos. Each recipe includes a full ingredients list as well as the directions to prepare it. There is also a link to view the recipe online. Nutritional analysis per recipe – Calories, Fat, Protein, Total Carbs, Fiber and Net Carbs. 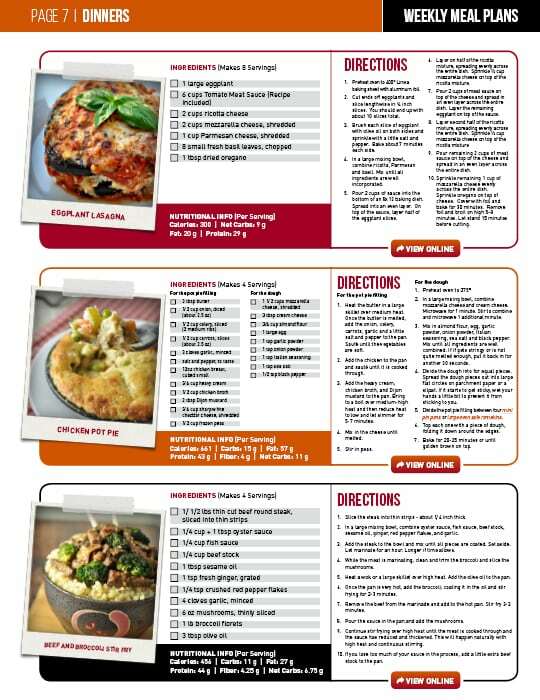 You can mix/match the recipes throughout the week to keep within the daily carb limit you choose. All recipes are less than 10 net grams of carbs per serving. Most are much lower. No funky, hard to source ingredients. Only real, nutrient dense foods that you can find at your local grocer. Suggestions for substitutions based on common food allergies, likes and dis-likes. Meal planning and prep tips to cut down on the amount of time spent in the kitchen. Printable grocery list for the week that will take advantage of groceries, using ingredients across multiple recipes. Each plan builds off the week before it to eliminate waste, maximize in-gredients and keep costs down. New low carb and gluten free resource added each week. Q. Can’t wait! Just placed my order. How do we let you know our food preferences? For example, no eggs for breakfast? A. Thesame meal plan will be sent to everyone, but will contain a list of substitutions for common food allergies, likes and dislikes. Q. Just ordered 4 weeks. Will there be a reminder email when the 4 weeks are over, or is this only going for 4 weeks? A. Reminder emails are not sent out. However, when you realize how much you love them and decide you want to order more, you do have the option to subscribe. You will be charged the $4.99 weekly and a new plan will go out every Friday. You can cancel your subscription at any time. Q. You say this is an opt in / opt out plan. What exactly does that mean and how will you know which week I am supposed to get? A. It simply means that you are never under any obligation. You can jump in or jump out at any time. I keep track of which week everyone is on. Even if you take a month off and then re-order, I will know which week you left off on and which week you should get next. Q. I love the meal plans but I need to cancel my subscription for the time being. How can I do that? A. Easy peasy! You can cancel at any time from within your Paypal account. Q. How many carbs per day are your meal plans? A. The meal plans will be set up so that you can mix/match your meals for the day to stay within the carb range that you want. All recipes will be less than 10 net carbs per serving – most will be much less than that. These plans will be suitable even for those that are trying to stay in the 20-30 gram per day range. Q. Are you only using recipes from your site, or will it be a mix of recipes from your site and your cookbooks? A. The meal plans will be a mix of recipes from my site, brand new recipes exclusive to the meal plans, my cookbooks and from some of my favorite low carb bloggers. Q. I am located outside of the United States, can I still use this menu plan? Will I be able to find the ingredients necessary to make the recipes? A. The meal plans are made with only unprocessed, real, whole food ingredients, making them easier to find in other countries. Q. Do you have a sample plan I can see? A. The sales page is very detailed and contains actual pictures from the meal plans. That way, you know exactly what to expect and there are no surprises. Q. How do I access my meal plans? A. Meal plans are sent out by email every Friday morning to everyone that subscribed for that week. If you do not see it in your inbox, please check your spam/trash folder and verify that you have the correct email address in paypal. If you have done those things and you still cannot find it, simply email me at kyndra@peaceloveandlowcarb.com and I will get another one sent right out to you. Q. Do the recipes in the meal plan contain dairy? If so, are there substitutions? A. Yes, the recipes have dairy. There will not be substitutions written in for the dairy, although in many recipes it can just be omitted. I will be developing more specialized plans down the road. Q. How many people is the meal plan intended to feed? Also, how much is the average weekly cost of groceries on your plans? A. It is written for 2 to 4 people but can easily be scaled up or down. As for an average weekly shopping cost, the price of groceries is different in every state—dependent upon the cost of living, minimum wage etc. However, many people have commented that after the first couple of weeks (after building up the fridge and pantry staples) that their grocery bills have been drastically reduced and that there is virtually no waste. Q. Why are there only 3 of each meal? I thought this was a 5 day meal plan? A. When you look at the meals for the week, you will see that there are 3-4 meals in each category – Breakfast, Lunch, Dinner, and Side Dishes as well as an extensive snack list. It is written this way so that there are enough servings in each category for 5 days worth of food. For example, between the 3 breakfast recipes in the Week 1 Meal Plan, there are 20 servings total. That is enough to feed 4 people breakfast for 5 days. I am utilizing leftovers to make this plan easy to stick to. The idea is to save money, reduce waste and spend less time in the kitchen. You can save that extra time for family and friends by prepping meals in advance and in the right portions so that you aren’t cooking every day, 3 times a day.